I just received word from Wipf and Stock that my book is now available in Kindle format. I neglected to change my Greek fonts when it was published in print, which is why there’s been a delay with the electronic format. Thankfully I had some time to comb through it last week and get the correct fonts in the manuscript. For those of you who enjoy reading on the digital screen rather than the printed page, you can order the Kindle edition here. For the 3 of you that are interested, my book is now available on Amazon. 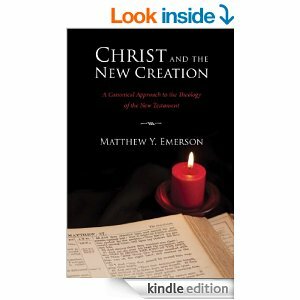 In Christ and the New Creation, Matthew Emerson takes a fresh approach to understanding New Testament theology by using a canonical methodology. Although typically confined to Old Testament theology, Emerson sees fruitfulness in applying this method to New Testament theology as well. Instead of a thematic or book-by-book analysis, Emerson attempts to trace the primary theological message of the New Testament through paying attention to its narrative and canonical shape. He concludes that the order of the books of the New Testament emphasize the story of Christ’s inauguration, commissioning, and consummation of the new creation.